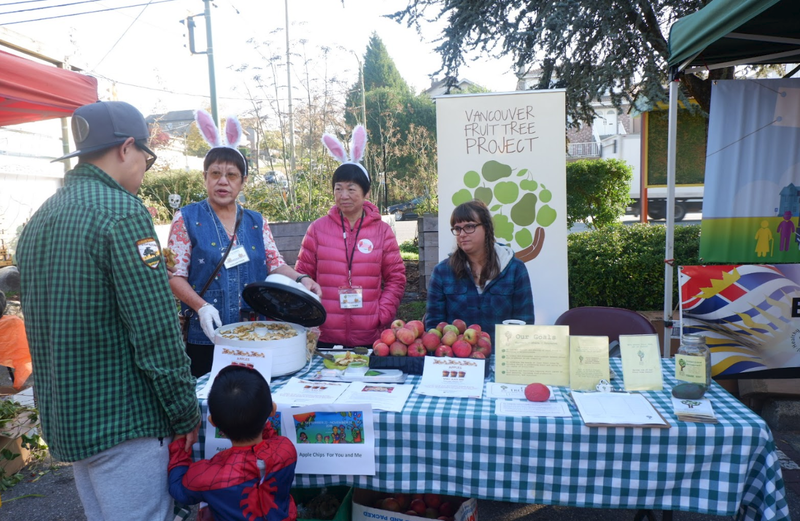 This morning (October 20, 2018), I attended Apples You And Me, a family-friendly event held in the Frog Hollow Neighbourhood House, and offered in the partnership with the Vancouver Fruit Tree Project. The Lead Picker Leader, Tiger Lilly from Vancouver Fruit Tree Project and two community volunteers from Frog Hollow Neighbourhood House were in charge of this event. “We have our volunteers to harvest the extra fruit from backyards and distribute them into community centers for like food activities”, said Lilly. Two volunteers, using the apples that were picked, spent about 8-9 hours using the dehydrator and making 5 bags of apple chips. These homemade chips were then given to the children and parents who attended the Frog Hollow’s 18th Annual Pumpkin Patch. This is an example of how VFTP tries to perform food recovery as a non-profit society. During the event, they did not only share the delicious apple chips, but community volunteers also brought the dehydrator and mandolin to explain the process in details. They prepared Tips for Homemade Apple Rings in the Dehydrator as well, so parents could use the instruction as a guide and make their own apple chips later at home themselves. Lilly also brought brochures about VFTP, providing information for the family with help of their backyard and volunteer sign up sheet if people are interested in helping harvest the fruit. “It is all connecting when we provide the apples and you made all the delicious amazing apple chips”, stated Lilly, as we tried the apple chips. The event was quite successful with about 45 people passing by our booth and trying the homemade apple chips. Almost everyone liked the taste of the chips, with several children coming back and asking for extra ones. Some parents got the apples and were interested in getting the dehydrator to make the apple chips themselves. Others found the work that the VFTP performs very meaningful and wanted to be more involved. Some donated money and other’s even signed up to become volunteers. About 3 or 4 parents asked if volunteers of the VFTP would be willing to help them set up their own gardens out in Burnaby. They were then provided with the information of other organizations in the area that could help and were very pleased to have the support. 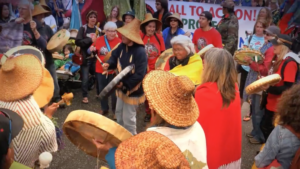 What VFTP and Frog Hollow Neighbourhood House did really allowed me a better understanding of the strategy-Asset-based Community Development in the real world situation. The definition of ABCD is to create opportunity and solve problems by identifying the assets, which they hadn’t recognized before, in the communities (Mathie&Cunningham, 2003). Usually, people with trees in the backyard do not have the time or enough knowledge to deal with the excess fruit, especially in the harvest season. It is quite a waste if we do nothing and all the fruit turns into ignored and unrealized resources. “We have a lot of fruit on trees, but we just do not know how to deal with that”, said a young couple to Lead Picker’s as they received advice for their backyard. Volunteers in VFTP could help harvest such resources and distribute them to the community centres. By providing those apples to the community centers, volunteers in the community like Frog Hollow Neighbourhood House could dehydrate apples into apple chips. The process is straightforward, just a few steps and lots of waiting. What you have in the end is a lot of food can be stored for several months with considerable nutritious value for people in the community. “Usually a bag like this size costs about few bucks in the grocery store, but actually we could just make it ourselves. All of it, apples, carrot, mangoes…..”, said the volunteer at the Frog Hollow. This is the importance for us to use the ABCD strategy, by finding the resources we already have and work together to make it valuable for people who need such a resource in the most proper way. So what can we do to use such a helpful strategy for our community? Apply to volunteer if you are interested in picking. Even though we might not be the expert in this field, with the lead of Picker Leader in the VFTP, we still help in an organized way. Attending events like Frog Hollow’s 18th Annual Pumpkin Patch is another way to be involved in the community and have a chance to learn more food skills like dehydrate food and meet people in organizations could bring help and useful information to you. It is not only a great opportunity for family and friend get together but also let you know what resource we have and lack in the community. What I find most significant is to think of our community as “our asset” by maximizing every resource to its greatest value and striving to benefit all. By doing so, the community can become a lovely warm family for everyone. Mathie, A. and Cunningham, G. (2003). From clients to citizens: Asset-based Community Development as a strategy for community-driven development. Development in Practice, 13(5), pp.474-486.